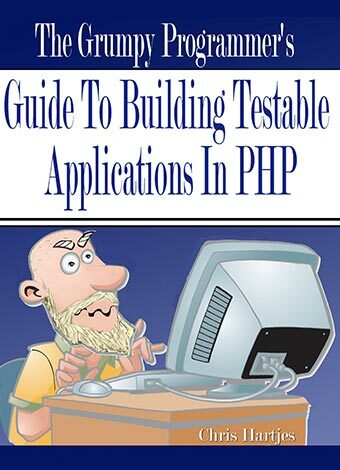 There are plenty of books that show the aspiring PHP programmer how to use testing tools. But how do you actually build your application in such a way that using the testing tools is easy instead of a constant struggle? This guide is aimed at helping intermediate level programmers build applications that should be easier to test and hopefully to maintain. If you're a beginning PHP programmer (or beginning programmer for that matter) this guide might be hard to follow. My goal is to show you that it really isn't a lot of extra work to create an application that consists of small modules of code that know how to speak to each other in order to solve larger problems. You'll learn why automated testing can be an essential tool and how your choice of components for your application makes all the difference in your pursuit of releasing bug-free code into production. Let my programming experiences help you become a better programmer and let you fix problems faster and add new features to your application with confidence. 60+ pages of pragmatic but opinionated advice about how to build and test your PHP applications.